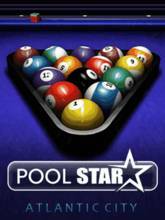 Pool Star is the most exciting and realistic pool game available on mobile to date. You'll be amazed by the jaw dropping graphics, accurate physics and highly intelligent opponents. Play 9 Ball, 8 Ball or Straight Pool on your own or against friends, or you can even play a game of Killer with up to 8 players in a special party mode. In Career Mode you take the role of Vinny, a young amateur with lots of talent but short on cash. Hustle your way through 7 days of action, playing trick shots, beating time challenges and running racks, all culminating in a final big tournament in Atlantic City. Succeed here and you'll unlock the Pro Tour where'll you'll pit you wits against the world's best.